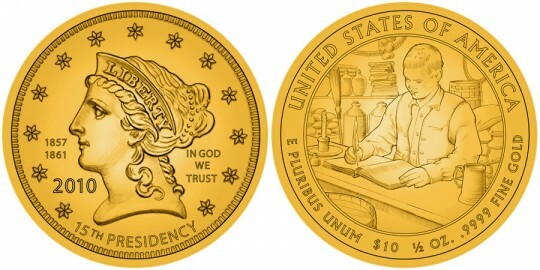 The Buchanan Liberty First Spouse Gold Proof Coin is the fourth coin in the series to feature an image of the mythical character Liberty instead of an actual woman. This is because the Presidential Coin Act of 2005 which authorized the series requires Liberty be used when the sitting President had no wife during his administration. In James Buchanan's case, this is especially true since he was a lifelong bachelor. Each coin is struck from 1/2 ounce of .9999 fine gold (24-karat) and is issued with a face value of $10. The First Spouse coins come in two finishes, either uncirculated or proof at each design is limited to a maximum mintage of 40,000 across all product options. Of note, while in office, Buchanan's niece Harriet Lane served as the official White House hostess. The Buchanan Liberty coin is also available in an uncirculated version. As Buchanan never had a spouse, the coin honoring his Presidency includes a design of Liberty that would have appeared on a coin during his administration. In this case the Liberty Head Quarter Eagle that appeared from 1840-1907, originally designed by Christian Gobrecht. Also shown are the words "IN GOD WE TRUST", "LIBERTY", "2010", "15th Presidency" and "1857-1861". On the reverse we see a young Buchanan working as a bookkeeper in his family's small country store. Also shown are the words "UNITED STATES OF AMERICA", "E PLURIBUS UNUM", "$10", "1/2 OZ. ", and ".9999 PURE GOLD".